This is a mellow hike along a wonderfully maintained tread to a 9000-foot summit and back. Despite the altitude and season the tread was almost entirely snow-free. On a sunny day you could hardly ask for a better mid-winter exercise. Of course we’ve just been through months of drought conditions and that has a big effect on the snow – your milage may vary. If you are searching for a true wilderness experience then the thicket of antennae atop Black Peak may not be to your taste. 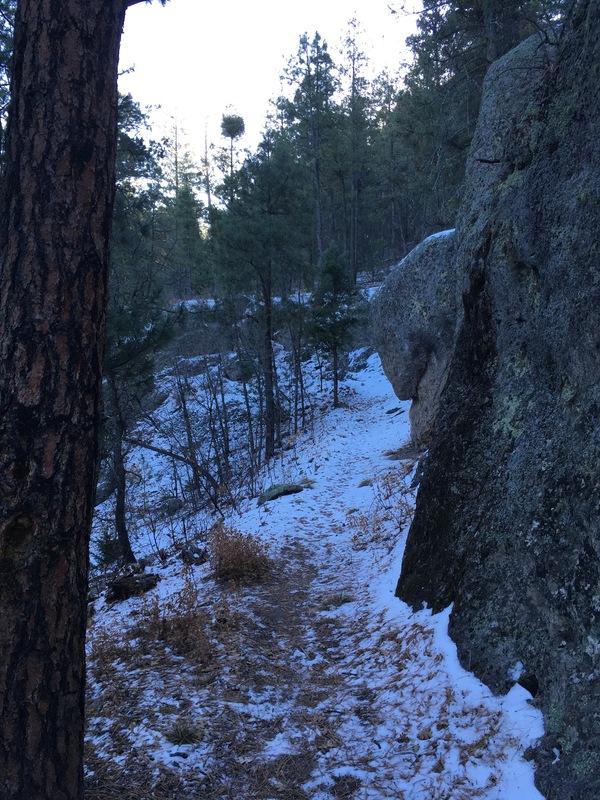 That said, any stroll in the Gila is a sovereign cure for the cabin-fever blues. The Interstate Highway 10 corridor (I-10) links El Paso, Texas to Las Cruces, Deming and Lordsburg in New Mexico, then heads towards Tuscon, Arizona. 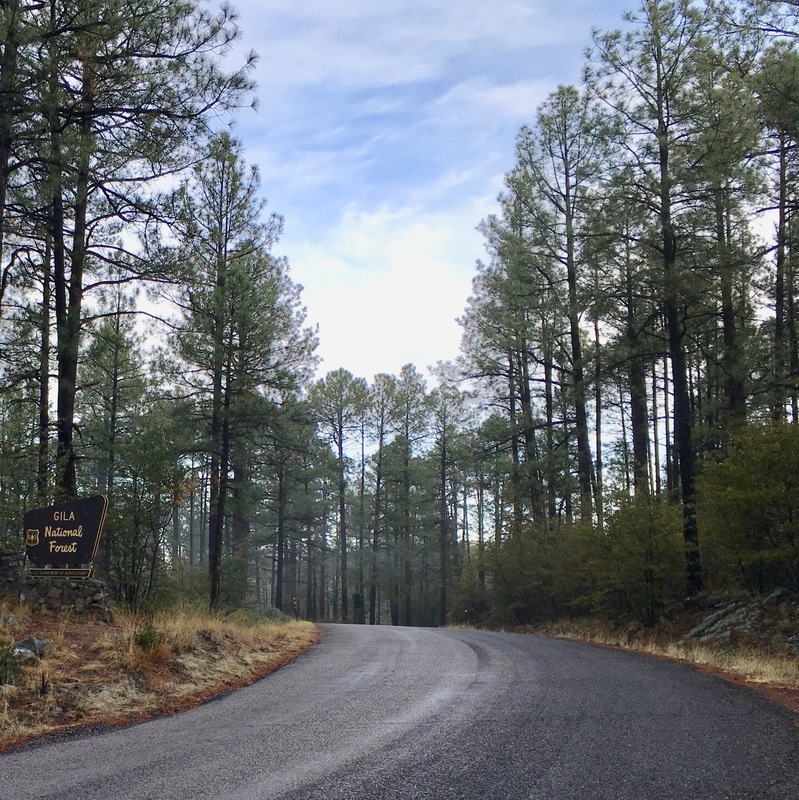 To get to the trailhead you first need to get to Silver City, which lies north of the I-10 corridor. If you are coming from the east then take route US-180 north out of Deming. If you are coming from the west then take route NM-90 north out of Lordsburg. At the intersection with US-180 in Silver City turn right onto US-180 East. After 8.3 miles turn left onto a small gravel turnout and park. As you approach Silver City you will see a “Silver City/Altitude 5900 ft” sign on your right at the top of a small hill. After 0.5 miles, at the first stop-light in town, turn right onto 32nd St.
After 1.3 miles, at a 4-way stop, turn right onto NM-15/Pinos Altos Dr.
After 7.3 miles turn left onto a small gravel turnout and park. NM-15 is a twisty and demanding drive, making it easy to miss the gravel turnout. 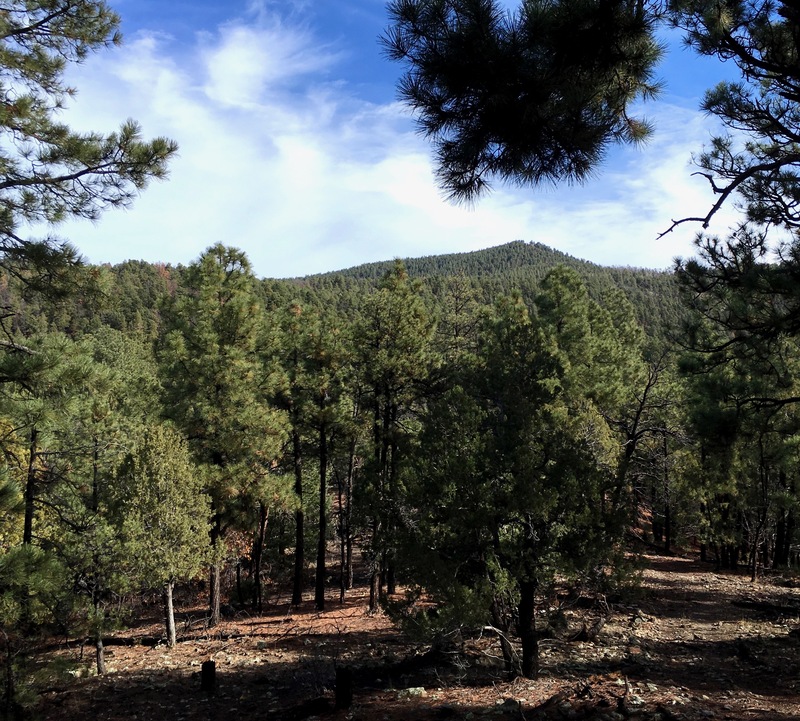 Watch for a sign on the left side of the road saying “Gila National Forest” (shown above). 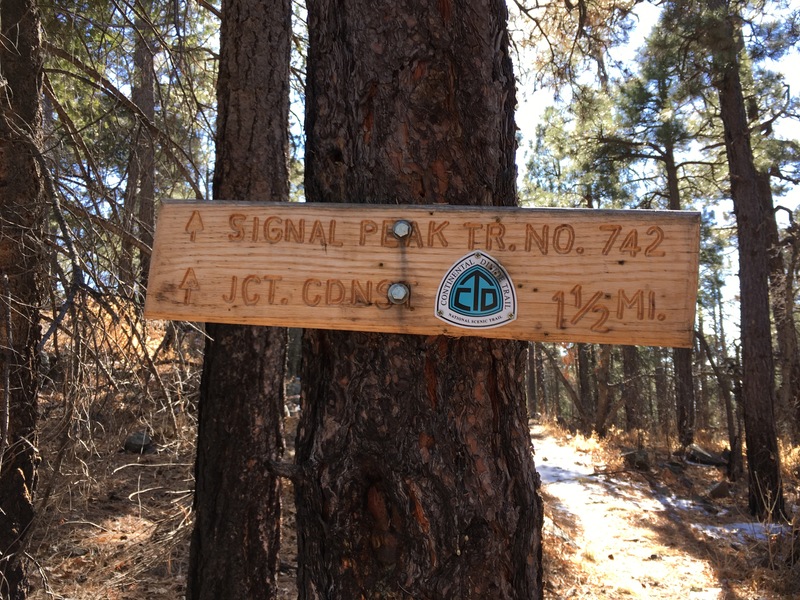 In a few hundred feet past this sign you will see a gravel road departing to the left signed as “4258J” (this is where the CDT rises up to NM-15). In another 100 feet the gravel turnout will be on your left. Past the turnout, in another 150 feet you, will see a large sign saying “WELCOME / Trail of the Mountain Spirits”. Winter driving on NM-15 can be hazardous. Snow on the road banks tends to melt during the day and then form ice patches as the sun sets. Similar mechanisms scatter rocks onto the roadbed during the night. It pays to be extra careful on this part of the drive. The trailhead is just a gravel pad on the side of the road. There is no water, trash receptacles or toilet. I brought water with me, but Bear Creek is nearby. If you were to head downhill on the CDT you might find water there. The Ley maps for the CDT indicate that this is an uncertain water source. It looks like 2018 could be a drought year so it is probably best to bring your water with you. From the trailhead go back along NM-15 to the junction with Forest Road 4258J. Look uphill, opposite the forest road, and you will see the trees bearing the rounded-triangle CDT logo. Head uphill along the trail. The lowest reaches of the trail have recently received a great deal of attention. The tread is clear and there are numerous large cairns. At 0.3 miles from the trailhead there is a junction with a road. If you look right you will see trailhead parking at the end of Forest Road 4258 and straight ahead is an animal track. Turn left, and follow the washed out road as it climbs. A side road comes in from your right at 0.6 miles (you need to veer slightly left to stay on the CDT). The tread rises steadily and is demanding enough to keep you warm on a mid-winter’s morning. Ambiguous fork. The white patch on the left is a sign saying “Trail”. At 0.8 miles come to a slightly ambiguous fork. The right-hand fork heads straight up the rib face while the left-hand fork levels off and contours around the western end of the rib. The left fork is signed as “Trail” but does not specify which trail. Take the left fork. 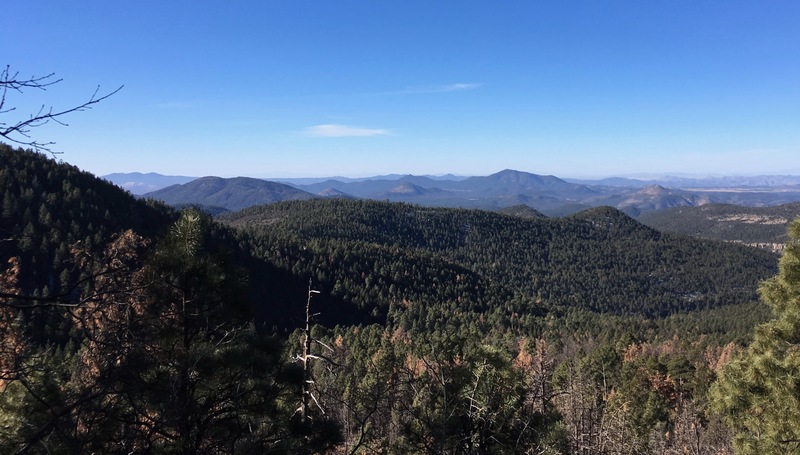 You are still on a gently rising and rock-strewn 2-track, but at this point you have risen considerably above the floor of Bear Creek and get great views into the western domains of the Gila National Forest. 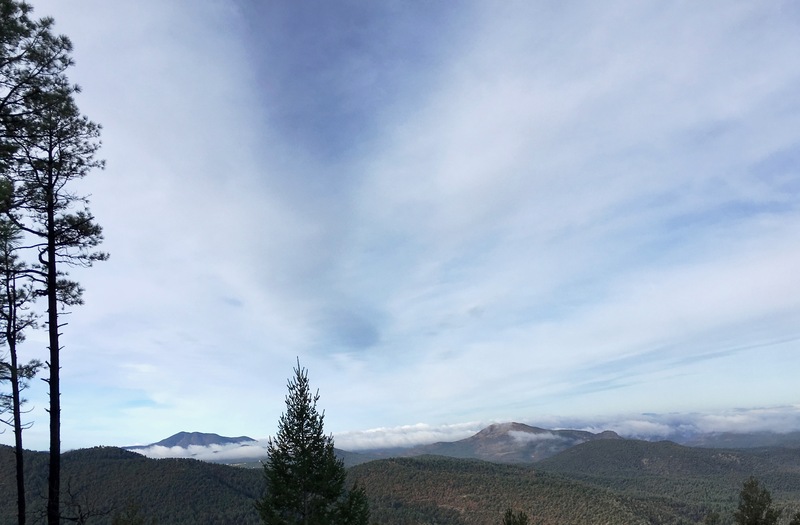 The western Gila mountains, atypically shrouded in low clouds. Eventually the road rounds the end of the rib, turns to the east and steepens to approach the rib top. The steeper angle seems to bring out the talus – watch those ankles! On your left is a heavily corrugated bowl containing both Miller Creek and Little Cherry Creek. At 1.9 miles the trail reaches the rib top and levels out. On this date recent rains brought new problems into play. Atop the rib the road bed contains an improbable amount of clay. When wet this clay is clingy stuff. It can form snowshoe-like masses of dirt around hiker’s boots. Did it come in on the winds? Was it deposited on an ancient sea floor and is now being exposed by erosion? If you are hiking at a later point in the season then you are not likely to have this particular problem. Instead you may encounter these clay particles as wind blown dust. Remaining sign near trail junction. At 3.0 miles from the trailhead the road comes to a junction where aged sign-boards survive but the text that once adorned these boards has burned out and faded away. On the far side of the junction there is a stake identifying the road you are on as FR 4258. Leave the road by turning left (on ascent) and continue eastward towards Twin Sister Peak. The new tread is a long -neglected forest road that has almost fully evolved into a regular foot trail. It makes a long approach along the rib top, past agave gardens and through stands of pinion and aligator juniper. At 3.7 miles come to an unsigned junction with another aging woods road and go straight across. Eventually the pair of knolls for which Twin Sisters Peak is named pulls into view. As you near them the pinion yields to ponderosa. The trail rises sharply then contours around the northwestern base of the knolls. Beyond them you gain the rib-top proper and are rewarded with good views to the south. Immediately below your feet is the canyon containing Twin Sisters Creek. In the medium distance you will see the strikingly prominent Bear Peak and the slightly more distant, triple-humped Burro Range. In the far distance lie the low hills above Lordsburg, New Mexico. The terrain steepens and the trail obligingly begins to switchback. A huge effort has gone into making this trail. Boulder fields have been re-organized into easy treads. Gully crossings are supported by rock walls. 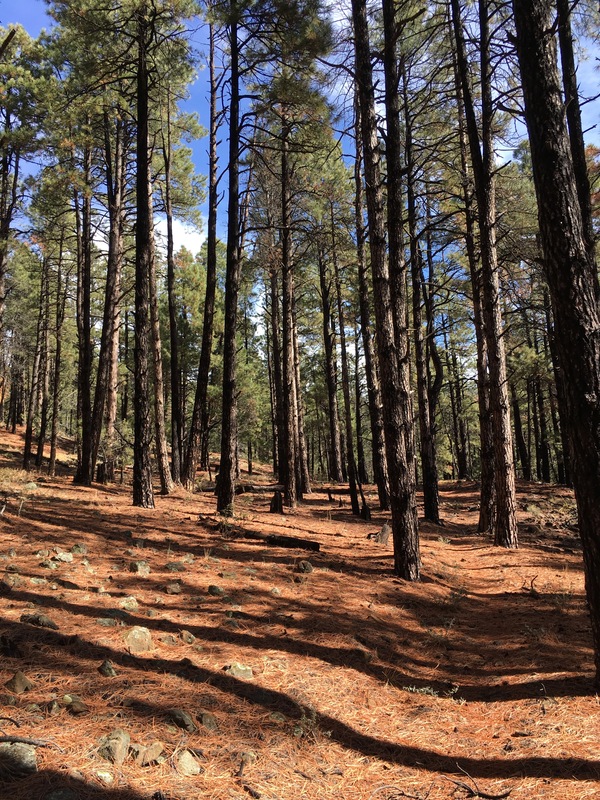 For a long stretch the trail takes you through gorgeous old-growth ponderosa pines, more park-like than any “real forest” has right to be. Each large tree is separated from its neighbors by 30 feet or more and the forest floor is covered in needles. In fact, the trail itself is covered in needles; remaining visible only as a faint furrow in the forest floor. Look for artifacts such as water bars and sawed-off deadfall help to confirm you are on course. At about 5.9 miles come to a signed intersection with the Little Cherry Creek trail, departing to your left. Stay on the CDT and in a few hundred more feet come to a circle of five Forest Service trail signs. Here the Sawmill Wagon Road Historic Trail comes in from the south (on your right on ascent) and it appears that a connector trail goes down to the Little Cherry Creek trail on your left. Veer slightly to your right to stay on the Continental Divide Trail. Cairn at base of burned tree marking summit junction. Douglas firs begin to make an appearance as you near the top . Also making an appearance are certain grim reminders of a recent burn. The trail swings to the northwest and at 7.6 miles comes to a fork that is clearly signed. CDT through-hikers will want to stay to the right, but to get to the summit of Black Peak you should veer to the left onto the Signal Peak Trail. In another 0.1 miles come to an junction marked by a prominent cairn at the base of a large burned tree. Turn sharply south (left on ascent) and follow an informal tread to the summit of Black Peak. Antennae crowd this summit, but there are terrific views across Silver City, past the Burro Mountains and into true basin and range territory down in the boot heel. Return the way you came. Most hikers will not have to deal with the “feet of clay” problem since these mountains are normally dry. So dry, in fact, that you don’t want to gamble on finding any water along the trail. Bring a full day’s worth. In the picture to the left I’m pouring out a gallon of water. Normally I don’t squander water on dry trails, but on today’s hike I took the extra gallon as part of getting into shape. Pouring this weight off while on the summit makes the descent much easier on the knees. Sadly, there was only one thin and small patch of snow along the entire route. Since there has been two days of rain in Silver City I was hoping for much more. 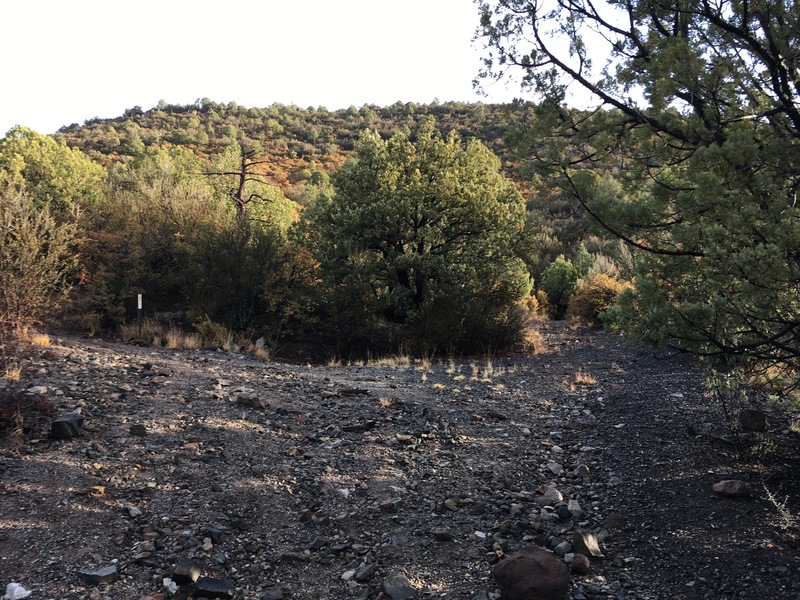 Even the higher Mogollon mountains to the west looked to be snow free. This is shaping up as another bad year for fires. As with the neighboring Signal Peak trail, this is a beautiful, easily accessed and very well maintained trail. 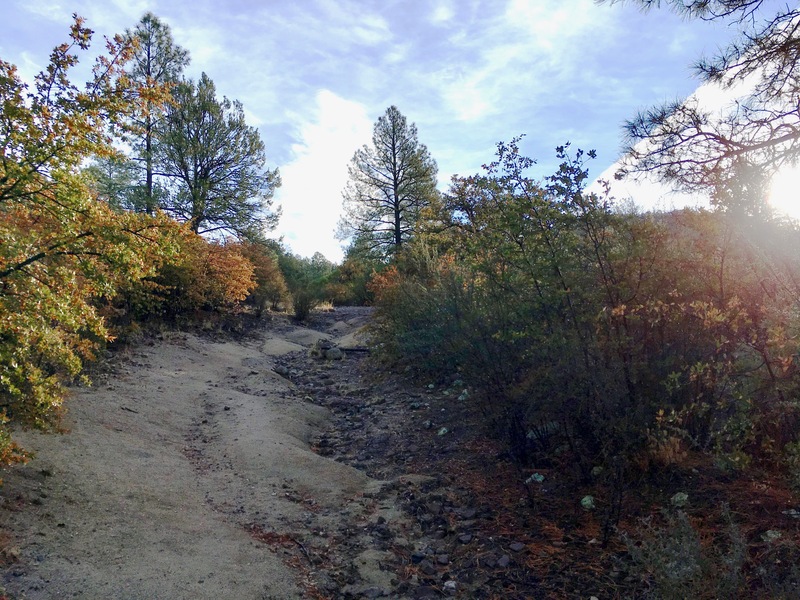 Folks in southern New Mexico who have tired of winter trips across Baylor Pass or around the Pine Tree trail should consider this venture to Black Peak as a terrific alternative. 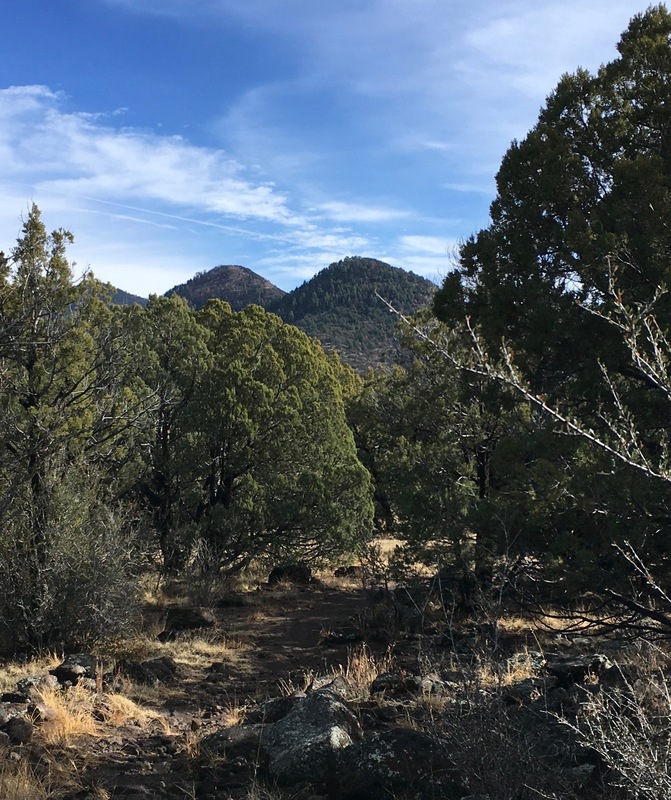 The Gila Back Country Horsemen of New Mexico have done some of the maintenance along the CDT, for a writeup see a post on their website here. In it they suggest an interesting 13 mile loop up the Signal Peak trail to Black Peak (so a much different approach than the route described here) and a return via the CDT and Forest Road 89. Rather strangely, that’s about all of the write-ups I’ve found on hiking the CDT from NM-15 up to Black Peak. Don’t let that dissuade you, this is a great day hike. This is a short hike, steep in the early stretches and distinctly civilized in terms of the antennae and fire lookout on Signal Peak. The tread is clear, much of the route is sunny and at 9000 feet it is low enough to to tempt when winter starts to drag. This outing demands little in terms of planning. 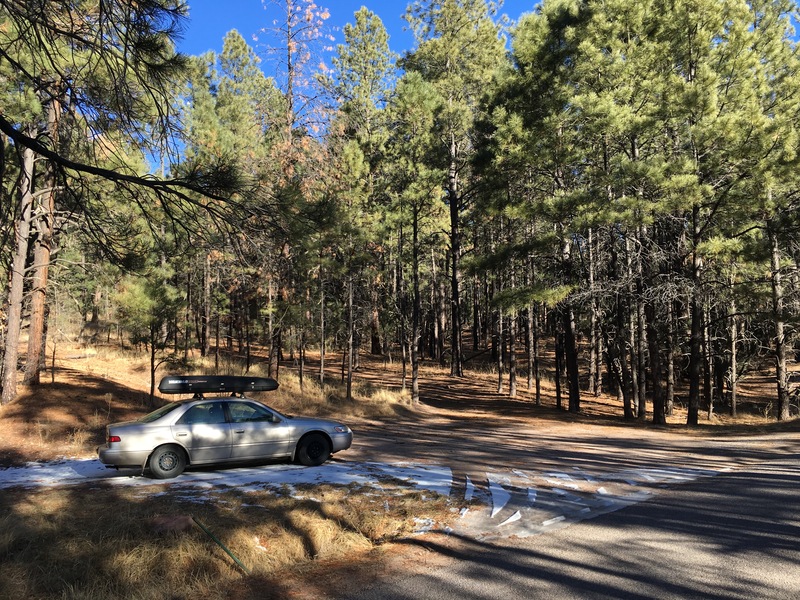 Just grab your pack, round up all the cabin fever victims and head into the Gila National Forest. The southern part of New Mexico is traversed by Interstate Highway 10 (I-10). From east to west this highway links El Paso (TX), Las Cruces, Deming, Lordsburg and then heads towards Tuscon (AZ). To get to the trailhead you first need to get to Silver City, which lies north of this corridor. If you are coming from the east then take route US-180 north out of Deming. If you are coming from the west then take route NM-90 out of Lordsburg. At the intersection with US-180 turn right onto US-180 East. 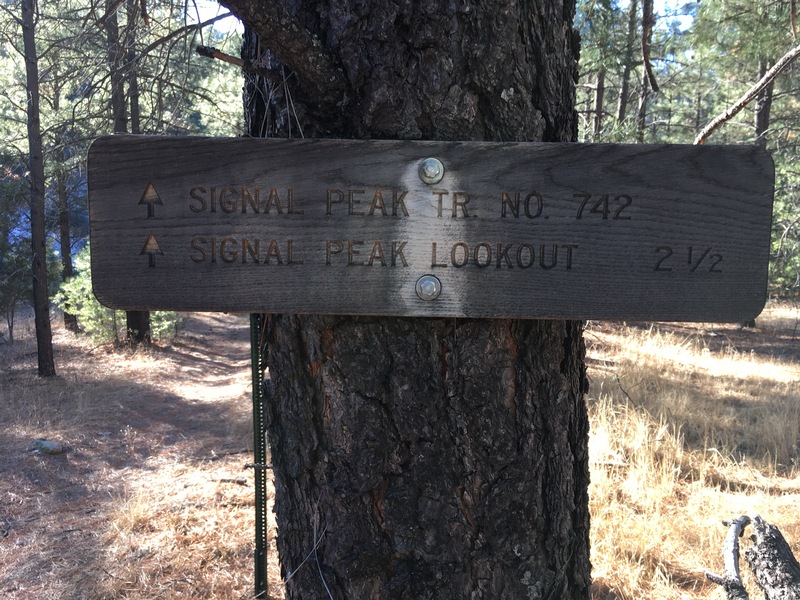 After 14.4 miles, immediately before a cattle guard, turn left into the parking for the Signal Peak Trail (there are signs for the trail on the road). As you approach Silver City you will see a “Welcome To Silver City/Altitude 5900 ft” sign at the top of a small hill. After 13.3 miles, immediately before a cattle guard, turn left into the parking for the Signal Peak Trail (there are signs for the trail on the road). Winter driving on NM-15 can be hazardous. Snow on the road banks tends to melt during the day and form ice patches when the sun sets. The road twists enough to inflict motion sickness on a rattlesnake and it performs these contortions on the cliffs above Bear Creek. Learn to love the traction. If you are returning home by way of Deming then it can be easy to miss the point where you turn left onto 32nd St. Look for a 4-way stop. Just before the stop there are signs signs on NM-15 indicating that you should turn left to get to the Nation Forest Service Offices. At the stop you should see a fire station on your right. The Mighty Camry, midst snow and ice. The trailhead is just a gravel parking area. There are no toilets, water or trash receptacles. There is only space for two or three cars. If it is full then the reports say there is additional parking a few hundred feet up NM-15. There is an old forest road, signed 4257E, that departs to the west (wrong direction) out of the parking area, don’t go that way! 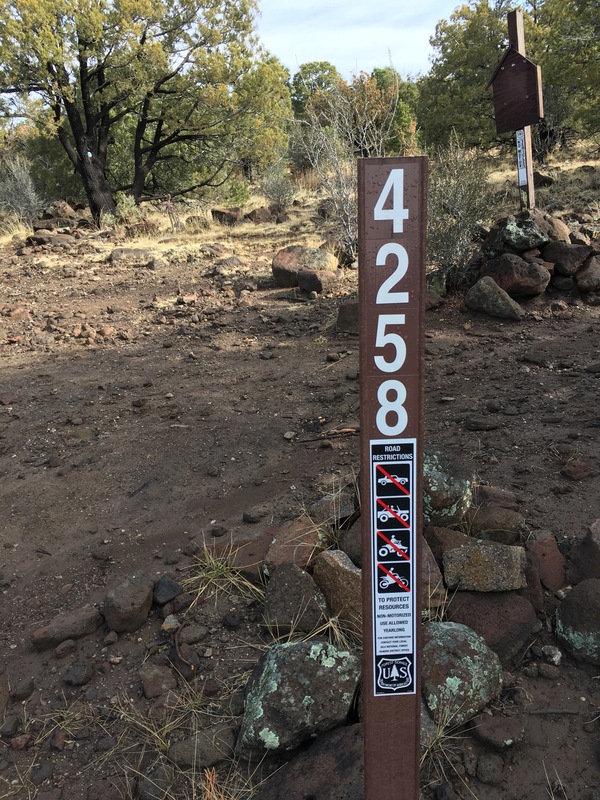 Instead, cross NM-15 to the signed entrance to the Signal Peak trail #742. Note on KML file: I left my GPS unit turned off at the start of the hike. Consequently, the initial 0.6 miles is missing but the tread is obvious and the return track shows the entire route. Cross NM-15 to find the signed start of the Signal Peak trail. The tread drops into a broad meadow, strikes the foot of Signal Peak and begins climbing in earnest. On a cool winter morning your fingers stay chilled for a while but the rest of you warms up fast. The tread is obvious even where it was cloaked in an inch or so of snow. 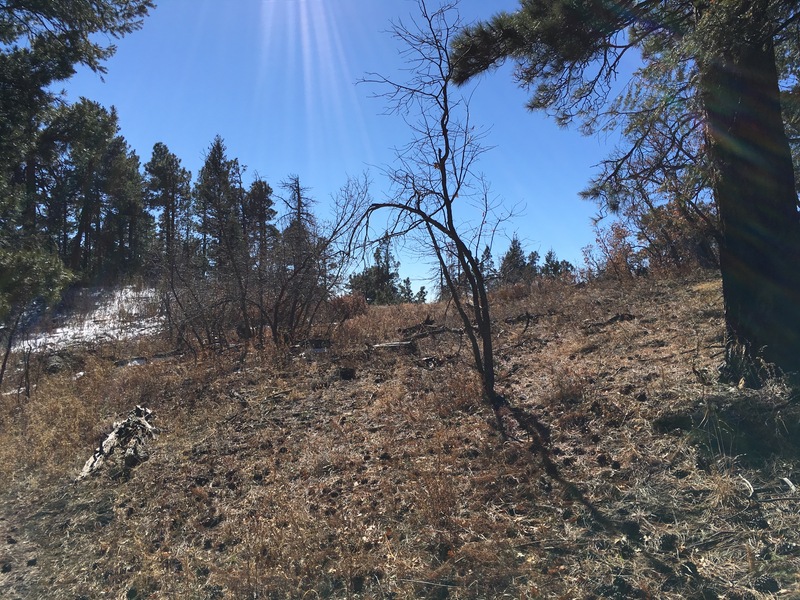 The terrain is populated by young ponderosa pine and (if you look into the woods on either side) rotting old stumps. Apparently the trail you’re on is an old woods road. The largest growing trees looked to be about 10 to 12 inches in diameter, so perhaps the logging occurred 80-100 years ago. At the half mile point the trail passes a wall of 20-foot tall boulders and begins switchbacking steeply to gain the top of a rib. The rib is itself steep enough to keep those switchbacks coming. At 0.9 miles you will reach a broad shelf and a glimpse through the surrounding ponderosa of the summit block. To your right you will get views to the southeast, including the round-top Twin Sister Peak (apparently the namesake of the USGS quadrangle) and the more distant Bear Mountain. The trail now contours around the summit block and makes a rising traverse along the block’s southeast face. Openings in the trees provide views to the southeast. The traverse ends at a small watercourse (1.9 miles from the trailhead) and makes a brisk turn to the north. In another tenth of a mile it comes to what seems to be a junction. To your left an obvious tread that ascends steeply towards a large block of stone that is partially screened by a small ponderosa. It turns out that this is a dead end. Instead, turn right and follow the tread as tops another rib and then follows the rib past hoodoos and scrub oak to gain the summit of Signal Peak, 2.2 miles from the trailhead. Black Range on horizon and snow-clad approach road below the tower. 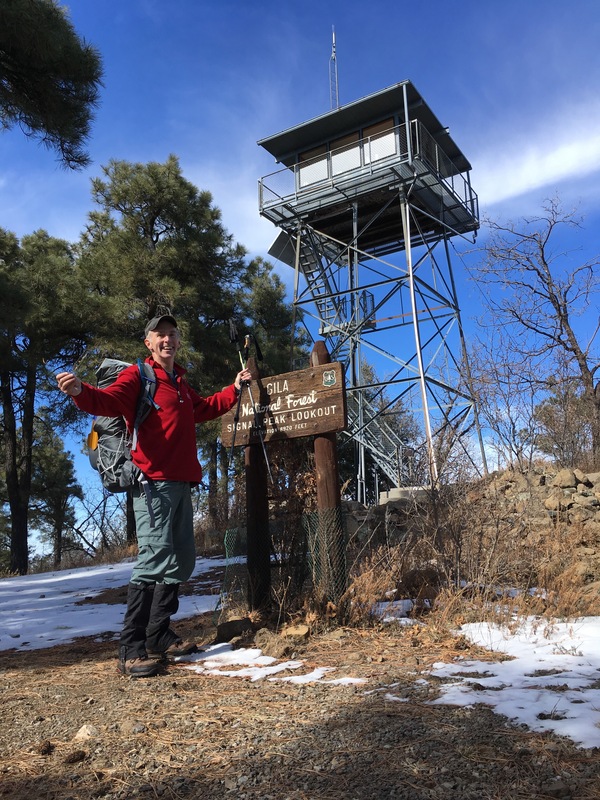 The summit is populated with antennae, a fire tower, supply hut, picnic table (with grill), a rustic helicopter pad and a strikingly well-maintained road coming up on from the southeast. This is a great place to take a break and drink in the surrounding views. The top of the tower is padlocked for the season, but you can still ascend the tower steps to get distant views north and east. (The south and west are blocked by trees). To the southeast lies the forested dome of Black Peak. Is your party up for a nice ridge ramble? Pick up that bag and follow the road out. Entrance to CDNST/Signal Peak trail overlap. The road arrives at a sturdy metal gate at 2.5 miles from the trailhead. Immediately past the gate the road makes a sharp turn to the left and begins to descend from the ridge. You should stay high and find the entrance to the Continental Divide National Scenic Trail (CDNST). It is currently flagged with a yellow sign warning hikers that trees along the trail are fire-damaged and especially prone to fall. True that; you will almost immediately begin to see fire scars on some of the trunks. The trail stays below the ridge top, on the northeast side. That does provide some amount of shelter from the prevailing winds. At 3.1 miles the trail begins a traverse of fire killed trees. It makes for a desolate winter scene. It also, however, opens expansive views to the north. You can only hope that the soils remain stable long enough to get this terrain reforested. Keep an eye out for woodpeckers – they seem to have no problem with coniferous devastation. In less than a quarter mile the fire damage eases and the tread resumes its quiet, rise-and-fall ramble through the trees. Watch for a sunny and open saddle above you, that is a sign you are nearing Black Peak. The fire has produced an unusual amount of deadfall and this deadfall can obscure trail junctions. Keep an eye open as you reach 3.8 miles from the trailhead, about 8940 feet of elevation. 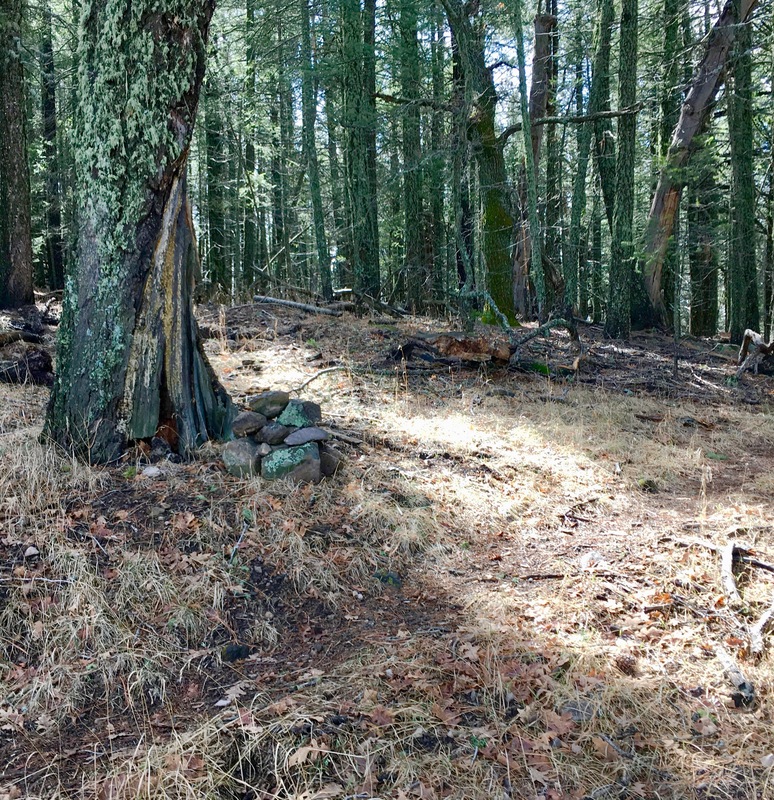 There is a blackened tree trunk on the right side of the trail (which may be the source of some of the deadfall) with a cairn at it’s base. Go off the CDNST and follow the short, boot beaten tread steeply uphill to Black Peak, 3.9 miles from the trailhead. This is another antenna-dominated summit, but one with terrific views to the south and west. Enjoy the views and return the way you came. This is an exceptionally clear tread, which is useful when there is a dusting of snow that might otherwise raise navigation issues. 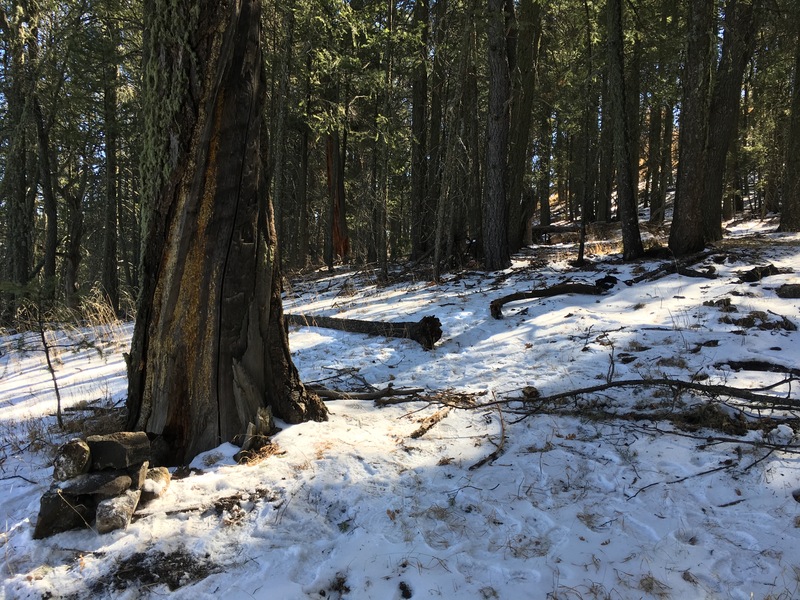 If you’re looking for a mellow winter hike and are getting a little bored with the Pine Tree Trail in the Organ Mountains then drive over to Silver City and enjoy a new winter destination. On this date there was just a dusting of snow, rarely getting over the top of my hiking shoes. I was happy to have gaiters with me as they protect the opening of the shoes and add warmth. If the snows got any deeper then it would be very advisable to wear boots and to watch for navigational challenges that pass your comfort level. Turning back is the smartest option under those conditions. The side-trail up to Black Peak can be a little hard to detect, particularly in contrast with the well defined CDNST. Watch for that sunny saddle and the cairn, keep your map in hand and monitor the ridge top. I had an altitude watch and found it very useful for checking the location on my map. Fire closures are a real thing, as this hike makes obvious. It pays to check in with the National Forest Service website, here. It includes good additional instructions about how to find parking for this hike if the first parking area is filled. 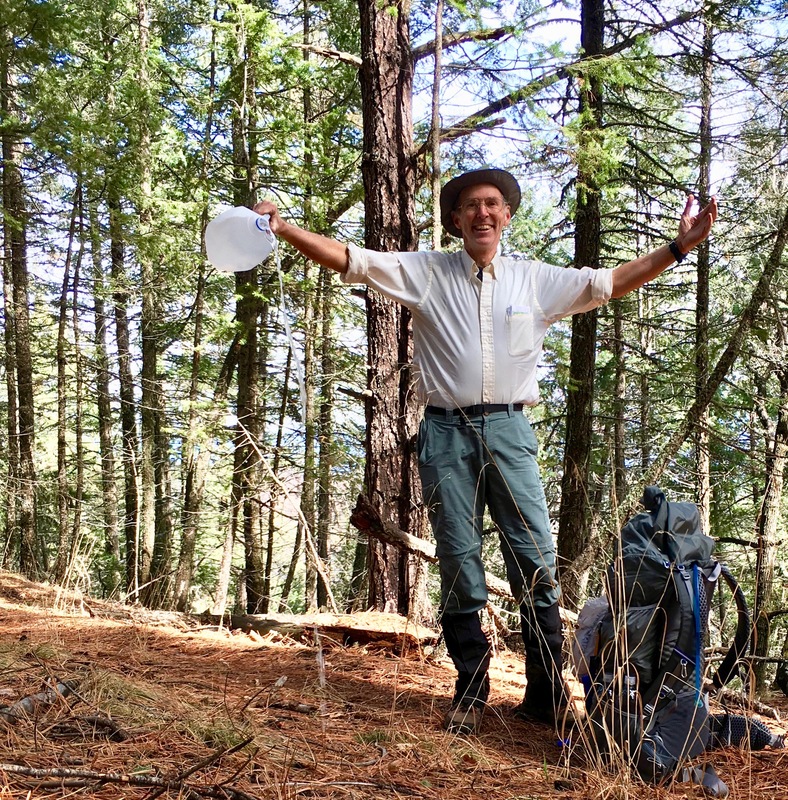 The 100 Hikes Near Silver City website documents a summer approach to Signal Peak. They note that it is a popular trail and they encountered several other parties on an April outing. 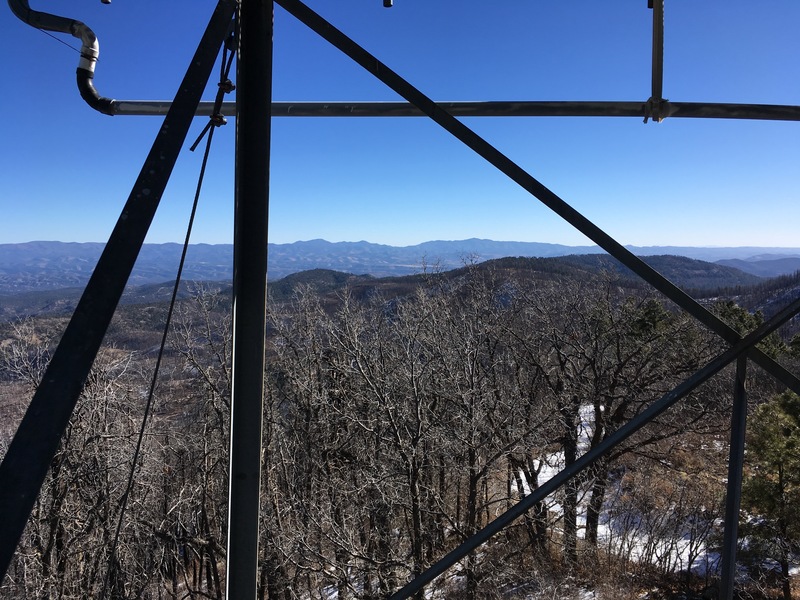 Southern New Mexico Explorer provides a brief description of this trail and comments about being invited up onto the top of the lookout tower – evidently the views are great. 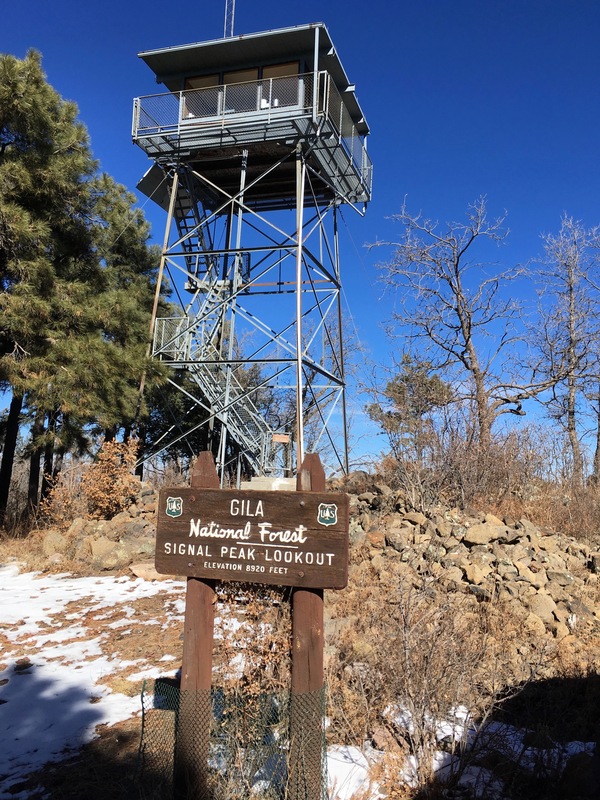 The Hike Arizona site also describes the trail and recommends it for people who are traveling along NM-15 to see the Gila Cliff Dwellings. Finally, the Summit Post writeup suggests that you can drive to the summit and provides directions. (I doubt that they meant for you to try this in wintertime).